The ‘whole point’ of new Government legislation is to protect nationals parks from fracking, South Downs’ MP has claimed. A House of Commons vote approving the new regulations, which would allow drilling in protected areas below depths of 1,200 metres, was met with anger by countryside campaigners last week. The Campaign to Protect Rural England (CPRE) Sussex branch said the changes would have a ‘grave and long-lasting environmental impact’ on areas such as the South Downs National Park. Meanwhile Trevor Beattie, chief executive of the SDNPA, warned that the landscape was not ‘skin deep’ and expressed ‘disappointment’ that fracking under national parks had not been banned. But Nick Herbert, Arundel and South Downs MP, said the ‘whole point’ of the new rules was to protect national parks. Speaking to the BBC this week he said: “A huge amount of the concern was that rigs were going to be set up in the national park at the surface, and that drilling was going to go down through the chalk and sensitive water aquifers. He explained how small pipelines could be drilled out horizontally at huge depths equivalent to the height of Ben Nevis and three times deeper than groundwater sources. Mr Herbert argued that ‘misleading claims’ had been made by campaigners about the vote whose real agenda was to oppose fracking in any circumstances. He continued: “The whole point of the vote on Wednesday was to ban it in national parks, which is why I, as MP for the South Downs, fiercely protective of the South Downs, making sure that we preserve them, was happy to vote for these regulations because that is what they are actually doing. 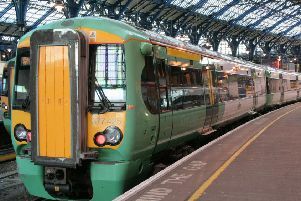 Although fresh licenses have been awarded for two new areas, one north of Bognor Regis and another between Chichester and the Midhurst, the latter of which is in the South Downs, Mr Herbert said any site would still require planning permission and could be refused by West Sussex County Council or the South Downs National Park Authority.